I have some really great news. I have joined the Design Team at 613 Avenue Create. This is my first week and I'm really excited to be working with such wonderful, creative ladies. I will be on Team B. This week's challenge is Grandparent's Day or make something for a grandchild/child. Our sponsors this week are The Paper Shelter and Shelly's Images. I chose to make a card for a child and I'm using the PRE-COLORED image called "The Most Adorable Panda" from The Paper Shelter. This card was so much fun to make. I started out by cutting 4 copies of this bamboo border on my Sihouette Cameo and making a frame from it. This was a little time consuming because each one of the "ties" was separate and I had to glue them all onto the frame. I distressed the frame to give it more depth. I then cut the bamboo stalks and leaves on my Silhouette Cameo. This was also very time consuming because each and every piece was separate and they had to be put together like a puzzle and glued in place. I then printed the panda image and hand-cut it. I then stamped the sentiment from Stampin' Up! and distressed it using creamy caramel ink and mounted it on old olive card stock. The frame, panda and sentiment are all popped up using pop dots. I really hope you will join us at 613 Avenue Create's blog and enter your projects into the challenges there! So cute Susan! I thought you must have a cameo to cut the bamboo. CONGRATULATIONS! They are lucky to have you! Whahoo! LOVE this card, so adorable.....holy moly that's a lot f work, BUT it looks FANTASTIC! Adorable. Love the image and use of dies. wow...sounds and definitely was a labor of love but look how beautiful it turned out. I LOVE LOVE LOVE it down to every little piece of bamboo and those little ties. This is adorable. I just love the big eyes on that cute Panda.And how neat is that cane tree that the panda eats. I am so embarrassed I can't think of the name now. Duh! 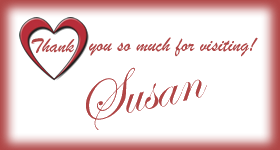 Congrats Susan!!!!! So deserving!!!! Love this card btw!!! It was worth your time!!! Super cute card, I linked up at 613 Avenue and saw it there. Really cute Susan, I love it! Super cute image and love the bamboo foliage, fabulous card Susan! Big congrats on your DT position! Susan, congrats for winning the Creative Fingers Challenge!! Well deserved! Gorgeous....love that sweet image! Thanks for joining us at Crafty Calendar this time & good luck!